Post was updated to reflect the upcoming Azure Rights Management support for Office for Android. Post was updated to reflect the timeframe for Office for Android support for Azure Rights Management. Post was updated to reflect that Outlook app on iOS and Android now support Azure Rights Management. Shobhit Sahay is a technical product manager on the Office 365 team. Earlier this year, we announced we are deeply committed to bringing encryption technologies on all platforms. At the core of encryption technologies is Azure Rights Management, which provides an easy way to protect data by assigning a policy to the data readily available in Office 2013, Office 2010 and Office for Mac. We are excited to announce that the same policy-driven protection is now available in Office for iPad and on iPhone devices. With this functionality, you are now able to view the rights protected Office documents natively on your iPad and iPhone devices. While using Office documents on iPad and iPhone, you can now view rights protected documents natively within the Office application. Word, Excel and PowerPoint all display the protected content with full file fidelity, retaining the same viewing rights permissions originally assigned to the document. While you can view the rights protected documents with this release, the capability to create, edit and publish rights protected documents will be released at a later date. Rights protected document viewed on the iPad. Rights protected document viewed on the iPhone. Outlook app on iOS and Android now support Azure Rights Management. Office Mobile will support Azure Rights Management with the Windows 10 Enterprise release in the fourth quarter of 2015. Office 2016 will come pre-instrumented with Azure Rights Management controls later this calendar year. 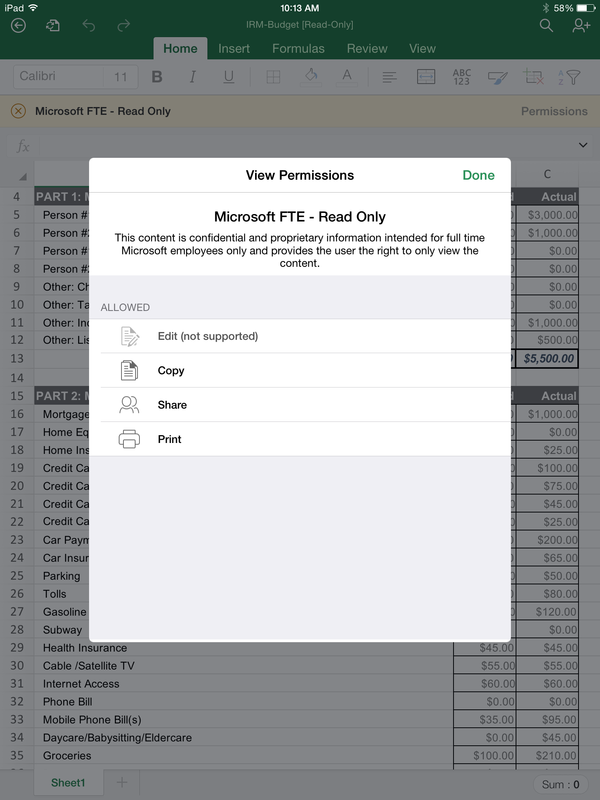 The rights management experience is going to get richer on Office for iPad and iPhone, with support for creating, editing and publishing rights protected documents coming in a later release. Office for Android will also support Azure Rights Management in the second half of 2016. We believe that providing you with such rights management controls will help you protect your data wherever you may be using the Office applications. We look forward to your feedback and releasing new enhancements in the coming months. For more news about other announcements from Azure this week, click here. Q. When are the Office apps updated for this capability? A. The updated Office apps will be available in the Apple App Store by July 23, 2015. You can then update the apps on your device and start using the functionality. Q. Can a Word, PowerPoint or Excel document be rights protected from within the Office apps on an iPad or iPhone? A. 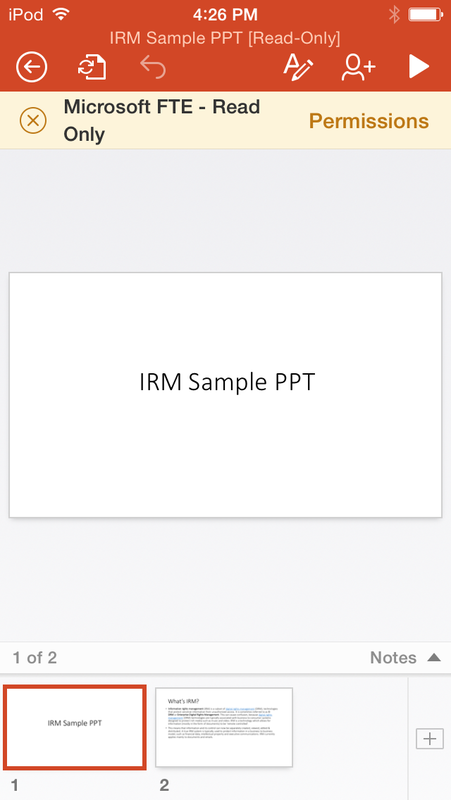 The current release will support only viewing of rights protected Word, PowerPoint or Excel documents on an iPad or iPhone. Creating rights protected content on iPads and iPhones will be supported later. Q. Will the recipient be able to edit a rights protected document if the sender gives that permission? A. This is not supported today but will be available in a later release.